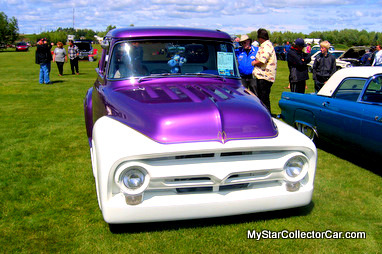 The first thing you notice about Phil Sicotte’s purple and white 1956 Ford F-100 is the big crowd around the vehicle. 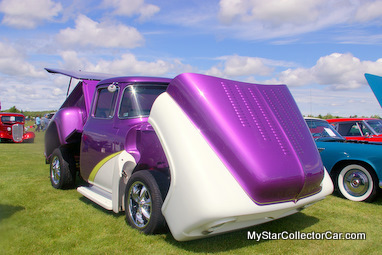 Phil’s truck is an amazing blend of style and imagination that is a favorite at any show. 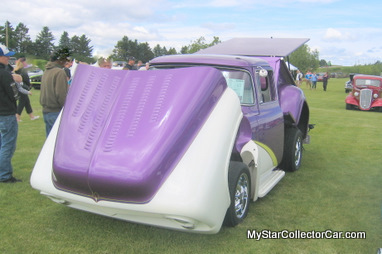 In fact, it was a show winner when we caught up to it this summer. Phil had worked a lot of magic on it over an eight year period of restoration, with occasional time-outs to work away from home in the seismic field. The result was an earth-shaking ride that will score high on any meters that measure good vibrations. 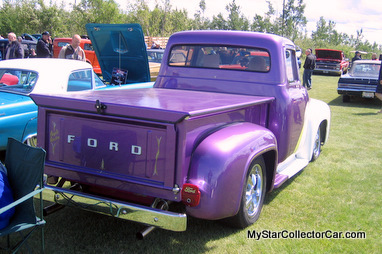 This truck is simply drop dead gorgeous. 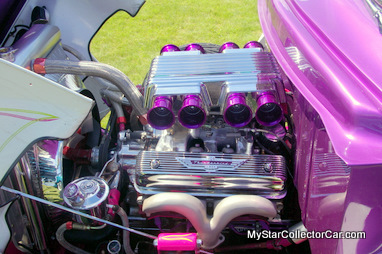 Phil is no stranger to wrenching and has a hot rod pedigree that dates back to the old school Elvis era. 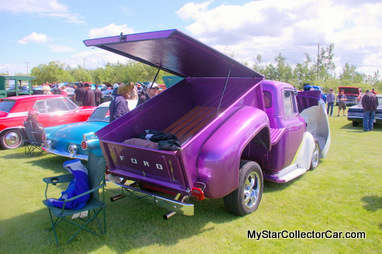 He is also a Ford boy, so his pickup is powered by a Y block 292 Ford that has powered it down the road for about 13 years-and counting. Phil has added new school fuel injection to his old school truck and has gone from 17 mpg to 17.56 mpg during the tinkering stage. But the big reward is an enormous gain in torque that “pulls like hell” in Phil’s words. 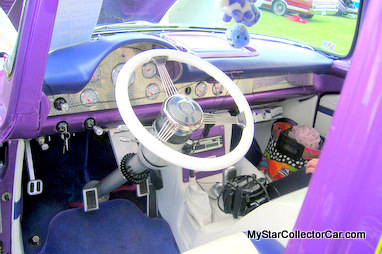 The F-100 has been modified for creature comforts such as AC and very comfortable seats that alleviate Phil’s wife’s back problems over the long haul. 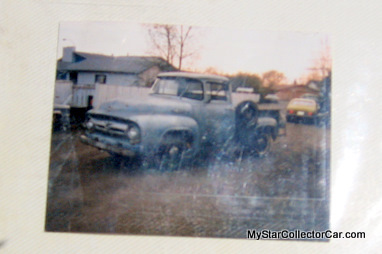 And the Sicottes like the long haul in their Ford, about 45,000 miles since the re-build. “Never build anything you don’t drive” is an old school anti-trailer queen philosophy that Phil lives by as an old school hot-rodder. 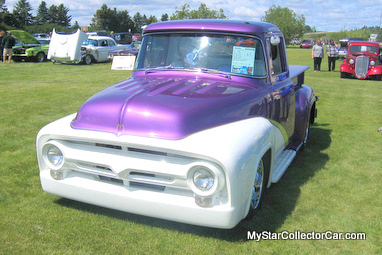 The truck has rack and pinion steering, plenty of power, and more than enough reasons for Phil to hit the road every summer with his beloved truck and his even more beloved wife. 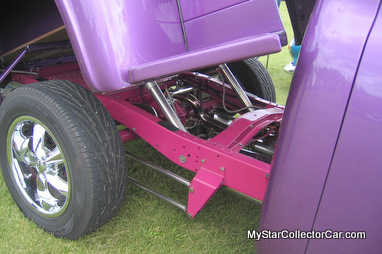 It has always been a winning combination for Phil: first place at car shows and in his marriage.